Martin O'Neill looks like a brilliant appointment by the Republic of Ireland. He ticks every box. He has won trophies, he commands respect for the career he has had both as a player and manager, and has managed at virtually every level of football with success. He has so much experience of club management that now seems the perfect time to take up a role in international management. Yet the big story to come out of his appointment, and the name everybody in Ireland wants to talk about, is not Martin O'Neill but his assistant. Of course, this man is the biggest name in the history of Irish soccer (as it's still called in large parts of Ireland). Roy Keane is box office and when he talks, people listen - regardless of whether they agree. He divides opinion with his strong and forthright views, especially in his role as a pundit. He has a strong character with true belief in himself and has a winning mentality that is second to none. Keane is a leader in every sense of the word but this is why many are asking: can he fulfil the role as assistant to O'Neill? It will be a very unfamiliar role and one which requires a strong mind, mixed with a more gentle approach when dealing with players. Players will rely on him for a shoulder to lean on and will want to use him as a buffer to get their views across to the manager. Roy took time for me when I made my international debut in September 1997. I was down and feeling sorry for myself after a nightmare performance against Iceland in which I was substituted at half-time. He probably recognised I thought my international career was over before it had really begun. In the days that followed he took the time to speak with me at length. He didn't mention the game but just spoke of my career to date. He knew quite a lot about me and where I was from. At that time I was playing for West Bromwich Albion while others in the squad didn't even know who I was when I first joined up. Roy left a big impression on me when I was only 20 years old. Martin O'Neill also made a lasting impression on me at an early stage in my career when I was just 16. It was the 1993-94 season and I was on a YTS (youth training scheme) with Preston North End. At the time Preston had an astroturf pitch and some opposition teams would come to train on the pitch the night before to get used to the surface. As I lived closest I would always be one of two YTS players on duty to make tea, tidy the dressing room or help with any problems that may occur. O'Neill was manager at Wycombe Wanderers in the old Division Three (now League Two) and he had brought his team to train. He didn't go out to watch or interact with them, he just left that to his coaching staff, and instead spent virtually the whole session talking with me and the other player, my mate John Calligan. Even though he was managing a less glamorous club, we both knew what he had achieved as a player and we were in total awe of him. He chatted to us both about what was expected of a professional footballer both on and off the pitch. We both felt 10 feet tall when he left us and it's something that stayed with me during my whole career. I only had the chance to thank him at a dinner last year while he was managing at Sunderland. The dynamics of the partnership is the most intriguing aspect of the appointments and it's the responsibility of O'Neill, and only O'Neill, to make everything work. I feel Keane can relax and really enjoy a different role from the one he has been used to and we will even start to see a different side of his personality which many are yet to see. Keane has the players' utmost respect but there are very few managers who would have the Cork man as assistant because they would see him as a threat. O'Neill is huge figure in his own right and Keane will learn a lot from him in his future coaching/management career. There is no reason why he can't even take over as manager in the future. Of course, the story on everyone's mind is when former Republic of Ireland boss Mick McCarthy sent Roy Keane home from the 2002 World Cup in Japan and South Korea following their infamous bust-up. Roy didn't like the preparations in Saipan and had always been outspoken about the Football Association of Ireland's previous choice of hotels and travel arrangements. Kilbane: "Second best was never going to be good enough Roy Keane. It never will be." The team now get the best of everything, largely down to Keane, and he will now have a say in these arrangements so no stone will be left unturned, that's for sure. Keane did come back and play for the squad during Brian Kerr's tenure after Mick had left his role, and in doing so he put to bed a lot of the questions regarding his commitment to his country. His commitment was never in doubt and what he wanted more than anything was success for Ireland. Second best was never going to be good enough for him. It never will be. I believe this partnership has huge potential and I hope they can inspire Ireland to qualify for Euro 2016. The Irish side has a big chance to qualify with the competition's expansion to 24 teams and this is why the job has appealed to O'Neill, and Keane, in the first place. 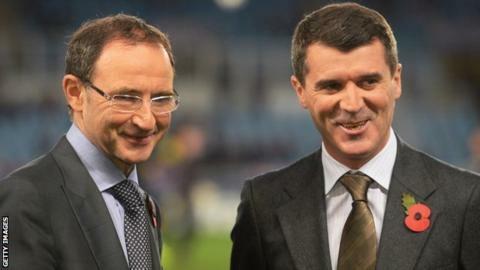 Read more on Martin O'Neill & Roy Keane: A Republic of Ireland dream ticket?